Can you really have the best of both worlds? Automobiles are cool. That's why you're reading this, right? 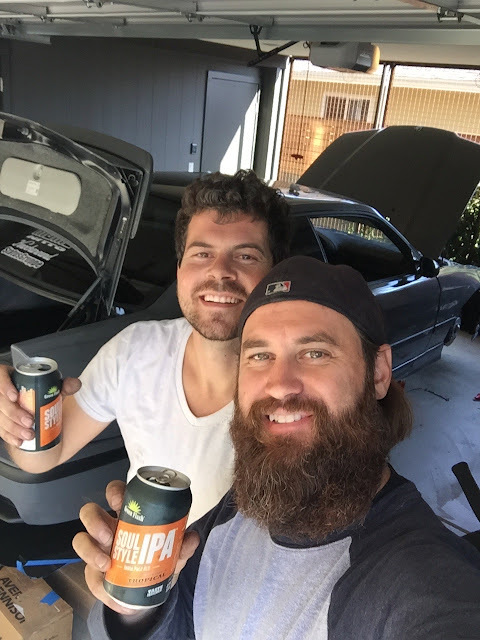 But, let's face it, when you lower a car or truck it becomes infinitely cooler and for our very own BMW E36 M3 project that's the look we were after. There are multiple ways in today's age to accomplish lowering your vehicle wether it be lowering springs, coil-overs or adjustable suspension (Air/Hydraulics). 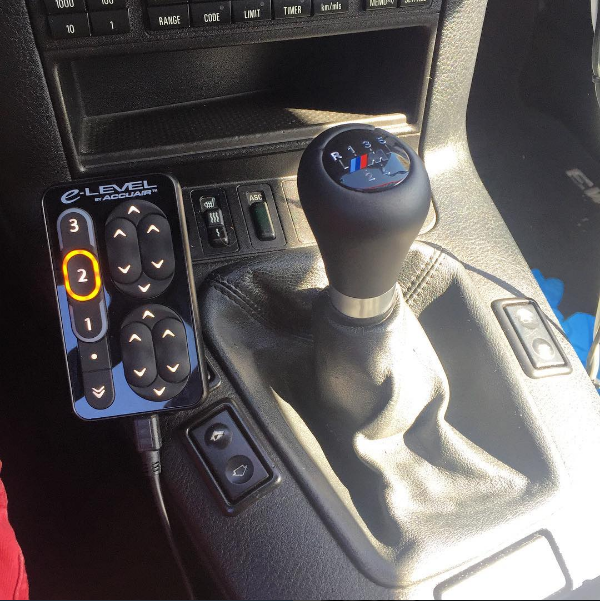 For us and our E36 M3 project, we were after something better than a rough riding "static" hard to adjust set-up. We wanted to know if there was such a thing as having the best of both worlds. You see, we are going to be using this car as a daily commuter, promo vehicle and booth vehicle at car events we attend for our brand, throtl. So driving comfort, on the fly precision adjustability, as well as an impossible chassis to pavement stance at shows (and at the grocery store, let's be honest) was a must for us. In order to achieve all of these features we reached out to industry leader and innovator AccuAir Suspension in San Luis Obispo, California to see if they had the goods we needed to accomplish such a feat. Of course they did and they have for over a decade. 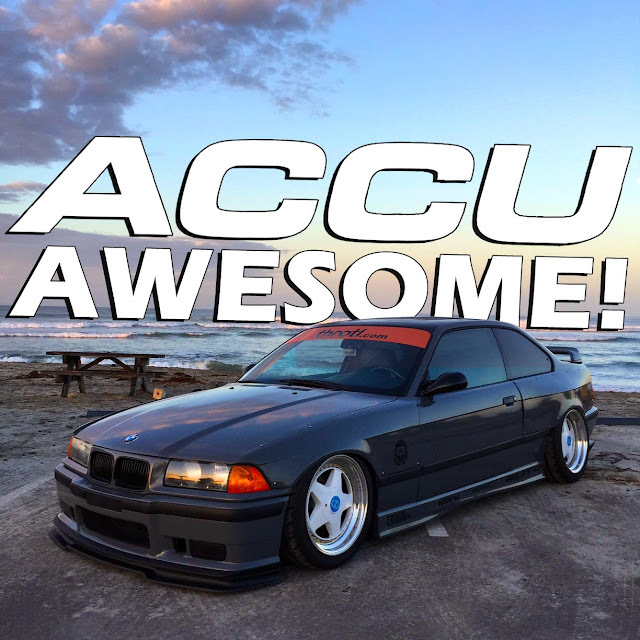 After a brief chat with the team at AccuAir about our desires for the car they suggested their flagship e-Level air management system paired with adjustable air springs. And that was that, we placed our order, added an upgrade or two to make sure our system was well optioned and anxiously awaited the knock at the door from our friendly delivery dude. We tore into the boxes above like children on Christmas morning. Being that the co-founders of throtl are both engineers and I have a terrible case of OCD we were excited about the ultra high level of quality of all the bits. Even the care taken and thought during packaging at AccuAir was eye popping. Once we were done drooling over the parts we began to lay everything out on a table to mock up exactly how we wanted to tackle mounting all the components and wire routing. Here you can see everything laid out and ready to be test fit into the trunk. We decided to upgrade to the AccuAir 70 amp power supply kit and also added a second compressor to speed up filling times on our gloss black 5 gallon air storage tank. More on that later. For the majority of the items, we simply mounted everything to a custom rubber isolated aluminum bracket that accomplishes two things: 1.) It keeps all the equipment in one central location out of harms way and 2.) It keeps the compressor noise and vibration into the spare tire well under the trunk floor tray. This allows us to use the trunk as it was intended and also does a nice job keeping the compressor noise to a minimum. With the carpeted floor insert installed all the equipment disappears. PERFECT! Would you look at those things on the left! 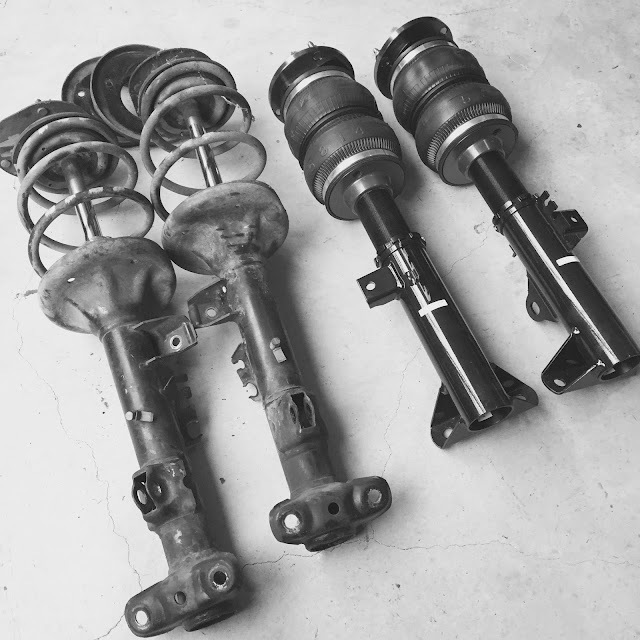 The tired M3 suspension was removed from the now dubbed #throtl36 chassis and replaced with these adjustable air spring units that gave us the comfort and suspension travel we were after once mated to the ingenious AccuAir e-Level air management setup. 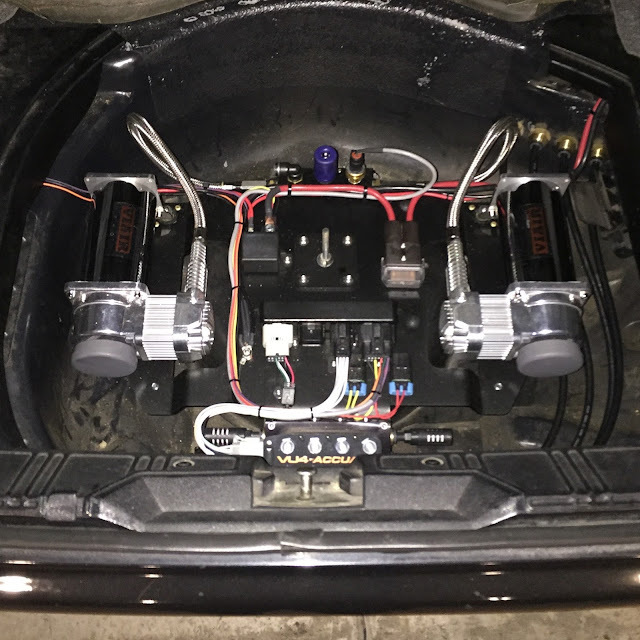 After mounting the air tank under the package tray utilizing an aluminum plate and AccuAir aluminum eXo Mount brackets we drilled four holes in the spare tire tub for the airline bulkheads. The video of the air tank install can be seen here. We then plumbed the air lines and sensor wiring harness safely and securely under the chassis and moved onto mounting the height sensors. These sensors tell the air suspension ECU where each corner of the vehicle resides height-wise at all times. If there is a discrepancy in the ride height on any corner or front to back the e-Level processes the height data and intuitively corrects for it. SO AWESOME!! 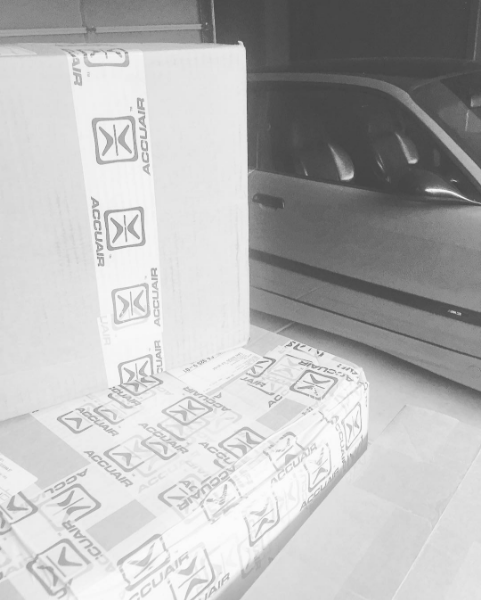 During our wait for the AccuAir equipment to arrive to us, we read up on the online installation manual and had a few discussions with friends who have already installed air suspension. They all recommended acquiring universal height sensor brackets to ease in the fabrication side of the project. We reached out to air suspension install experts Boden Autohaus in Orange County, California and had them send us out four of their nicely water jetted universal brackets. These things came in so handy and surely sped up the location and mounting process. After referencing the install manual, some measuring and elementary calculations we then mounted our brackets/height sensors and gave them some test cycles using jack stands under the chassis jack points and a hydraulic floor jack under the wheel to make sure our calculations were correct and we had full range of travel without binding or over extension on the height sensors. BANG! Nailed it first try and for that Evan and I treated ourselves to an exquisite San Diego beverage - GreenFlash Brewery IPA! Once we got the entirety of the system mounted and tested we moved our attention to calibrating the system, setting our three ride height presets, which was super simple per the instruction manual and locating a suitable place to mount the gorgeous machined aluminum e-Level touchpad interface. We were so impressed with the overall quality and look of this piece that we were hell bent on mounting it somewhere that would adequately showcase it as a centerpiece of the system. We decided on the center console just to the left of the manual gear selector as the perfect location. We used a cell phone mount for versatility versus hard mounting it. Fast forward now four months - the system has been an absolute pleasure and probably our favorite mod on the car. 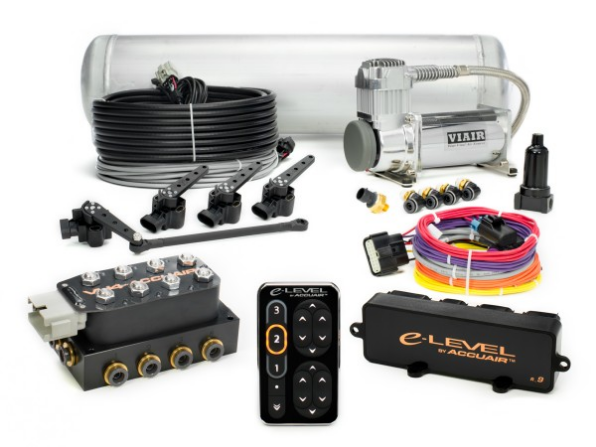 The e-Level air management system has worked flawlessly and we highly recommend it to anyone looking for the best all around suspension solution for their daily or show vehicle. What did we learn? With AccuAir you really can have the best of both worlds! And we will continue to add their products to every car we build from here on out.